Sherrill Bambauer has been providing clients with financial planning and investment services since 1974, in Redding, California. In 1986 the University of California, Davis, awarded her the Certificate in Personal Financial Planning after she completed the two year course of study. She is a Registered Principal offering securities through SagePoint Financial, Inc., and is an Investment Advisor Representative with SagePoint Financial, Inc.
Sherrill received her Bachelor of Arts degree from University of Arizona, completed the requirements for her teaching credential, and taught mathematics, English, (and other subjects) for seven years prior to entering the financial services industry. 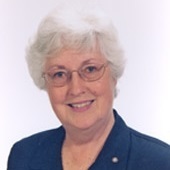 She and her husband have lived in Redding since 1971 and have five grown children and thirteen grandchildren. Their very helpful and experienced staff members are Brenda Kreps and Mark Cheeseman.